Apple II History » 4-The Apple II, cont. 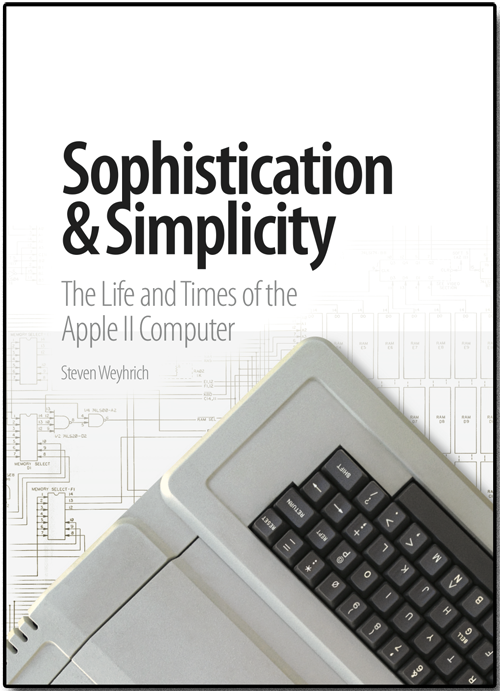 Get a copy of the DEFINITIVE history of the Apple II in print form! Marco Verpelli on 17-Languages, cont. Jobs thought the cigar boxes [housing the home-made computers] that sat on the … desktops during Homebrew meetings were as elegant as fly traps. The angular, blue and black sheet-metal case that housed Processor Technology’s Sol struck him as clumsy and industrial … A plastic case was generally considered a needless expense compared to the cheaper and more pliable sheet metal. Hobbyists, so the arguments went, didn’t care as much for appearance as they did for substance. Jobs wanted to model the case for the Apple after those Hewlett-Packard used for its calculators. He admired their sleek, fresh lines, their hardy finish, and the way they looked at home on a table or desk. Other aesthetics to which Jobs paid attention were the color of the keyboard, vents for heat dissipation (avoiding the need for a noisy fan), and a shape and color that would blend in with other items in a home or on a desk. He also hired an engineer who was good with analog circuitry (not Wozniak’s area of interest) to design a reliable, lightweight power supply that would stay cool. The engineer, Rod Holt, was working at Atari at the time, but was convinced to help Jobs and Wozniak. He developed a new approach (for microcomputers) by taking household current and switching it on and off rapidly, producing a steady current that was safe for the expensive memory chips. The final design of this switching power supply was smaller than a quart carton of milk and was quite reliable. Holt also helped design the television interface for the Apple II. The computer that appeared at the West Coast Computer Faire was not one person’s machine. It was the product of collaboration and blended contributions in digital logic design, analog engineering, and aesthetic appeal. The color, the slots, the way in which the memory could be expanded from 4K to 48K bytes, the control of the keyboard and hookup to the cassette recorder, and the BASIC that was stored in the ROM chip – in effect the motherboard – was Wozniak’s contribution. Holt had contributed the extremely significant power supply, and Jerry Mannock the case. The engineering advances were officially recognized when, some months later, Wozniak was awarded U.S. Patent #4,136,359 for a microcomputer for use with video display, and Holt was given Patent #4,130,862 for a direct current power supply. But behind them all Jobs was poking, prodding, and pushing and it was he, with his seemingly inexhaustible supply of energy, who became the chief arbiter and rejector… [Finally,] the combination of [Mike] Markkula [Apple’s first president], Jobs, and the McKenna Agency turned Apple’s public bow [at the West Coast Computer Faire] into a coup. As they prepared for the display at the First West Coast Faire, it was decided to create a new corporate logo. The original logo, used in sales of the Apple-1, was a picture of Isaac Newton sitting under an apple tree, with a phrase from Wordsworth: “Newton…A Mind Forever Voyaging Through Strange Seas of Thought…Alone.” Jobs had been concerned that the logo had been part of the slow sales of the Apple-1, and the Regis McKenna Agency was hired to help design a new one. [Steve] Jobs was meticulous about the style and appearance of the logo … When Janov suggested that the six colors be separated by thin strips to make the reproduction easier, Jobs refused. For the Faire, Markkula had ordered a smoky, backlit, illuminated Plexiglas sign with the new logo. Although Apple had a smaller booth than other companies displaying their products at the Faire, and some of the other microcomputer makers (Processor Technology, IMSAI, and Cromemco) had been in business longer, Apple’s booth looked far more professional, thanks to Markkula’s sign. Some of the other participants, companies larger than Apple, had done no more than use card tables with signs written in black markers. Because they had been one of the first to commit to displaying at the Faire, Apple’s booth was near the entrance and was visible to everybody entering the convention center. They demonstrated a kaleidoscopic video graphics program (possibly an early version of “BRIAN’S THEME“) on a huge Advent display monitor, catching everybody’s attention. But, after the Faire its organizer Jim Warren (Homebrew club member and editor of Dr. Dobb’s Journal) didn’t think that Apple was a strong exhibitor. Byte magazine, in their report of the show, failed to even mention Apple. Despite these early opinions by influential people, over the next few months Apple received about three hundred orders for the Apple II, over a hundred more than the total number of Apple-1’s sold. The first motherboard-only Apple II computers shipped on May 10, 1977, for those who wanted to add their own case, keyboard, and power supply (or wanted to update their Apple-1 “system” with the latest and greatest). A month later, on June 10, 1977, Apple began shipping full Apple II systems. Due to the high cost of RAM, the Apple II was originally available for $1298 with 4K, or a whopping $2638 for a full 48K of RAM. Compare this with the cost of other prebuilt systems sold by Commodore (the 6502-based PET, for $595), and Radio Shack (the Z80-based TRS-80, for $600.) Apple’s price did not include a cassette recorder or monitor (which both the PET and TRS-80 did include.) However, the hardware limitations and lack of expandability of those machines offset some of the price difference. 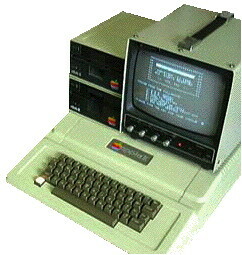 Of those two computers, neither was designed to make it expandable to allow the addition of memory or more hardware, whereas the Apple II was expansion-ready from the start. Also, one other hardware introduction for the Apple II that happened in mid-1978 set it well ahead of its immediate competitors; this will be discussed in a later chapter. The first Apple II computers sold were literally rough around the edges. The plastic cases were made with a different process from what was used later, and after returning from the company that molded them, they had to be painted the correct beige color, and some areas had to be sanded smooth. They had a toggle switch for power (instead of the rocker switch used later.) These cases also lacked ventilation slots on the sides. For at least for some users this resulted in excessive heat build-up during use, causing the case to soften and sag. Early users who had this problem were given a replacement case with the ventilation slots that remained a fixture through the remainder of the life of the product. 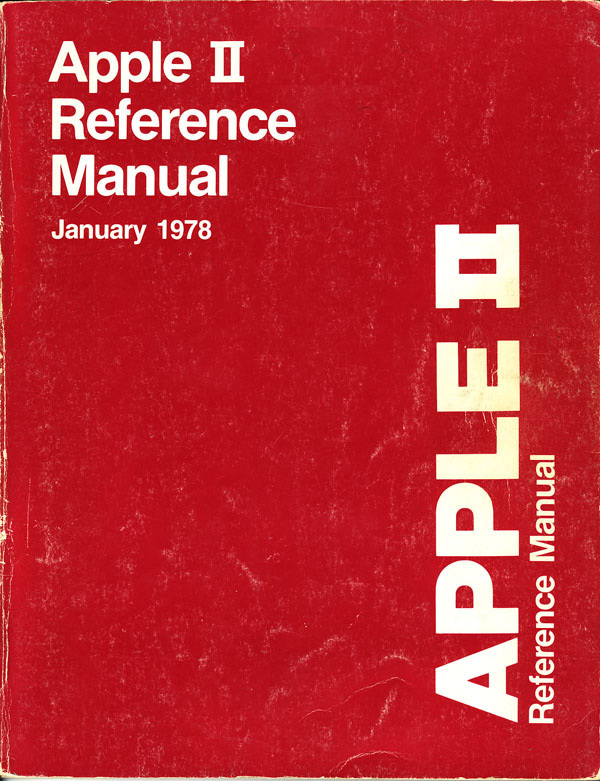 In early 1978 these original photocopied manuals were replaced with the new Apple II Reference Manual (also known as the “Red Book”), and copies were mailed to previous customers. However, the material was essentially the same as the mini-manual, just with a red cover. Steve Jobs realized that people often viewed the quality of a product by the quality of its documentation, and so he wanted Apple to have manuals that were easy to read and had a professional appearance. Employees Jef Raskin and Brian Howard wrote the first Integer BASIC manual, and Raskin agreed that a proper reference manual was needed for the Apple II. He assigned Chris Espinosa the task of converting the material in the Red Book into a full fledged manual. During his fall semester at Berkley in 1978, Espinosa wrote the manual, and then used a typesetting program on the Berkley UNIX system to create that first manual. Setting up the Apple II was fairly simple. The lid popped off easily, and one of the first things usually added was the RF modulator, to allow the computer to display text and color graphics on a standard television. This was attached to two pins sticking up from the back rear of the motherboard, near the video output jack. Those who bought a proper NTSC computer monitor did not need to bother with the RF modulator. The earliest game paddles included with the computer had a lever that could be moved back and forth, with a button to press. Later versions of the game paddles were small black boxes, with a knob to turn and and a tiny black button on the side (which would be painful on the finger if being used in a game that required repeated pressing of the button.) These game controllers were attached via a narrow cable to a plug that looked (and was) fragile; this plug went into a small socket in the motherboard. After turning on the Apple II, the first thing to greet the user was a screen full of random alphabetic characters and symbols, and possibly some colored blocks (lo-res graphics mode might be turned on.) At this point it was necessary to press the RESET key in the upper right hand side of the keyboard, which would cause the speaker to “beep!” and an asterisk to appear in the bottom left-hand corner of the screen. (If the lo-res graphics mode had been on, it would now be off.) The asterisk was a prompt to show that you were in the Monitor, and next to it was a flashing box, the cursor. To get into BASIC, you had to press the “Ctrl” key and the “B” key simultaneously, and then press RETURN. Now you would see a different prompt, one that looked like a “>”. Functionally, here was one of the first ways in which the Apple II had the advantage over the Apple-1 — BASIC was resident in ROM, rather than requiring the language to be loaded from cassette. At this point, the new Apple II owner could either begin entering a BASIC program, or try to load one from cassette. The cassette recorder was attached to the input and output ports on the back of the computer. To load from cassette was not always easy; it took time to get the right volume and tone settings on the tape player in order to avoid getting the “ERR” or “*** SYNTAX ERR” message. (And if the Apple II didn’t have much memory, the “*** MEM FULL ERR” message would appear.) When the program loaded properly, it was usually necessary to type “RUN” to get it started. In the first few years that the Apple II was sold, there were three primary sources of software available to the new user: The user could write his own programs (BASIC or assembly language); he could enter programs from listings found in magazines or books; or he could purchase software. The purchased software came on cassette tapes, usually with sparse documentation, and packaged in zip-lock bags. Some of these were programs that had simply been saved to tape, either with the SAVE command in Integer BASIC, or with the command to write bytes to tape from the Monitor. A color-killer circuit to get rid of color fringes on text when graphics were not being displayed. In issue #6 of Apple’s Contact newsletter from June 1979, they distributed information about how users could add this hardware fix to earlier models. Power-on RESET. With the Revision 0 Apple II, it was necessary to manually press the RESET key after turning on the power. Furthermore, on these oldest boards the keyboard would often send a random character to the screen after pressing RESET, making it necessary to press Ctrl-X (to clear the line) before starting to enter text. The automatic RESET circuit eliminated the need to press the RESET key, and the keyboard no longer sent a character to the screen. Additional hi-res colors. The Revision 0 boards could only generate four colors in hi-res mode: Black, white, violet, and green. Wozniak later discovered that a small change in the color circuit would allow the 8th bit of a hi-res byte to phase shift violet and green, allowing the addition of red and blue hi-res colors. Jumpers to allow the video out circuit to work on non-U.S. PAL and SECAM television standards, plus an additional single pin video connector on the motherboard. Cassette output correction. Sounds sent to the speaker in Revision 0 boards also would go to the cassette output, which would interfere with data saved to the tape. Cassette input improvement. Revision 1 boards would work better with a weak cassette input signal. In the Revision 0 motherboards, there was an area in the lower right of the motherboard, underneath the keyboard, that was completely empty of chips. This was intended for hobbyists to add their own circuits. The Revision 1 boards used this area for the chips needed to add the additional hi-res colors and the power-on RESET circuit. Most new Apple II owners simply purchased the M&R; Sup’R’Mod to display video on their color TV. However, some other enterprising hackers designed their own versions of modulators. One used by an early member of an Apple user group in Washington State (Apple Pugetsound Program Library Exchange, or A.P.P.L.E.) was somewhat better shielded than the Sup’R’Mod. It had its own power supply and plugged into the video output jack on the back of the Apple. However, the Sup’R’Mod was by far the biggest seller. At first, there were no interface cards for any of Woz’s eight slots. With the limited funds that computer purchasers had then (and now) there was not much they could afford after shelling out anywhere from $1200 to $1800 just to get their own Apple II. But they were innovative, and like many other hardware hackers of the day managed to make do with old or surplus parts. Some people, for instance, had gotten their hands on used teletype printers, such as the ASR-33 (called “battleships” because they were so rugged and heavy.) Since there weren’t any printer interface cards to plug into the slots to allow the computer to communicate with the teletype, they used a trick they learned from Woz himself. The Apple II had four single-bit output pins on the game controller socket that could be used for various purposes. A schematic floated through the various user groups that showed how to connect the teletype to an annunciator pin; along with it was a machine language program that re-directed output from the screen to that one-bit port, and on to the printer. Nearly any product needs customer support. The more complex the product, the greater the need for that support. The Apple-1 was a marvel of compact design compared to other first generation microcomputers, but it still needed a fair amount of hand-holding for those who owned it when something didn’t seem to be working. This created somewhat of a problem for Apple in managing technical support for the Apple-1. Although only 200 to 250 were sold, most questions about it had to be handled directly by Steve Wozniak. When the Apple II was released, tech support calls for that computer were handled by everyone in engineering (and sometimes by the production line technicians as well.) But an Apple-1 call still had to be handed over to Wozniak. It was decided at Apple that the most effective way to handle long-term tech support was to convert Apple-1 owners into Apple II owners. This was further enforced by the forward-thinking attitude of Steve Jobs, who now considered the Apple-1 to be yesterday’s news, and insisted that any intelligent person would obviously want to upgrade to an Apple II. I remember buying an Apple ][ in March 1979 that had a sticker on the keyboard: “I’m Proud – 48K !” or something similar. That’s great! I wish you had a photo of that sticker. I do not understand how you can generate six colors. Reserving 1, 2, 3, 4… bit in video memory you have 2, 4, 8, 16… colors. But you say that SW added two colors to the original four. Does this mean that one bit was wasted? In addition, 280 x 192 pixels require 6.5 KB to 2 colors. I wonder how many colors and offered resolution version of 4 KB. The reason this doesn’t make sense is because the Apple II generates color based on a trick involving the NTSC video signal, rather than doing it as full RGB the way modern computers do. Per this article, the Apple II utilizes omission of the interlacing signal, enhancing the difference between the monochrome and color signals that are output. It results in hi-res dots that are close together being displayed as a color, instead of two separate dots. It’s a complex connection between color and video frequency, but it was an inexpensive hack back in the day when Woz designed the Apple II. The result is the odd combination of just a few colors in hi-res mode, and the anomaly of some colors that don’t display well next to each other. Thanks Steven for your answer! I understand that you explain about the trick in the video chip of computer but my question is about video memory and the alleged resolution of 280 x 192 pixels. I suspect that this resolution required a 8 / 16 KB RAM and that model with 4 KB can not have hi-res because to represent a graph of 280 x 192 with 2 colors (1 bit) requires 6,5 KB and 4 colors (2 bit), leaving aside the trick, will need 13 KB. 1. six colors mean 4 simultaneous colors drawn from a palette of 6? 2. basic model with 4 KB of RAM have minor resolution or Apple implemented an Atari 2660 style approach? If the latter is correct then with 4 KB you get the alleged resolution, but to program such computer will be a trip to hell and I never heard that of Apple II. All I can tell you is that the hi-res graphics uses 8K of RAM from $2000-$3FFF for page 1, and another 8K from $4000-$5FFF for page two, it does work, and it is very simple to use. The number of colors desired does not have an impact on how much memory you use. The placement of the bits in each byte determine how the colors appear, and although the colors do work, they are flakey (some colors don’t display well next to each other). We never used terms like “palette” when doing hi-res (or lo-res, for that matter) on the Apple II. As for memory: A 4K Apple II would be unable to do hi-res graphics, since its RAM only goes up to $1000. It would take a minimum of 12K to have at least hi-res page 1 usable, and 16K for both hi-res pages, but you’d have a very small footprint for your program (only from $800 to $2000, only about 6K). By the time the Atari and Commodore 64 (and VIC-20) came out, I am sure they had conceived better methods of color display, and had an arrangement that made more sense. Woz designed things the way he did to save on chips, and the trick that he came up with allowed the Apple II to be the first homem computer with color graphics. And then Apple let the Apple II design sit and stagnate for the next 16 years, making only small incremental improvements (like double hi-res in the 128K Apple IIe and IIc). It was the IIGS that really brought color graphics forward into the next decade, and even that was hobbled by the need for backward compatibility with older software. The Apple II History by Steven Weyhrich is licensed under a Creative Commons Attribution-NonCommercial-NoDerivs 3.0 Unported License.